June 2008 – Life happens!! I check the door like 10 times before I leave for work and before I go to bed at night, I have to make at least two rounds checking the doors. I doubt that I have OCD. I heard that singing in the car makes you happy, so I sing loudly and dance while driving, Rehema the other day told me :’too loud, Mommy’ I have to say, I am always happy after I leave the car. There is this song that is always playing on the radio…”I can ride my bike with no handle bars” what does that song mean??? I love reading autobiographies, currently I have Arnold Schwarzenegger’s. I would like to read Barbara Walter’s but it was stolen from our local library. I don’t buy them, I borrow them from the library. I just finished reading Larry Kings. I don’t care for nails at all. I keep mine clean but I think nail polish/varnish is a waste of money. At least I don’t bite them. At times when I am driving, I get panic attacks and wonder if I am driving on the right side of the road since I used to drive on the left when I lived in Kenya. I still put on my wipers instead on my turn lights because that is the side the turn lights were. Please go check out how weird perfect some people are here, you might realize that you are not so quirky after all and we still love you, quirks and all. I cannot believe it’s already Friday. Next week, my baby will be 5 months old!! Wow! I have not weighed myself yet since I write these posts the night before. This week was basically the same as last, walked everyday, went to the gym twice and did some exercises at home. So Thursday Idecided I need to change some things around and add more serious strength training to my life. I came home from work in a hurry, changed, and was driving like a maniac so as to be there when it starts. The group class is held in one of the city recreational facilities and they charge $1 per class. I reached on time and then guess what? they had cancelled classes until after July 4th. I was so disappointed. This week I tried to keep a food diary and it is amazing how the diary makes a difference in your eating habits. You realize just how much you eat that you probably do not need to eat, I bet if you had to show someone your food diary, you would probably eat right. I plan on going on a 5K run tomorrow, hope I am able to fit it in somewhere. It’s Friday…yippee!!! and tomorrow I get to take Rehema to her most favorite place and it will be just the two of us, I bet she will love that. Please check out the other Fitness of Friday participants here. Have a great weekend!! I am still using the stuff from my pantry, the only food stuff that I have bought are milk, fruit and yogurt. I have been surprised at the meals that I have been coming up with and usually the testing comes when the child eats it. If my child eats it, then it is good. I have even made home made baked beans and they were pretty good. The pantry is beginning to look bare. 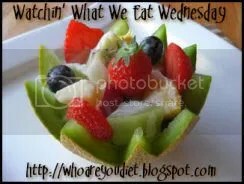 It’s Wednesday and I am joining Lorie from “Honey, I shrank Myself” and today’s post is the fruit edition. I am going to post a very simple simple fruit recipe, I cannot even call it a recipe. 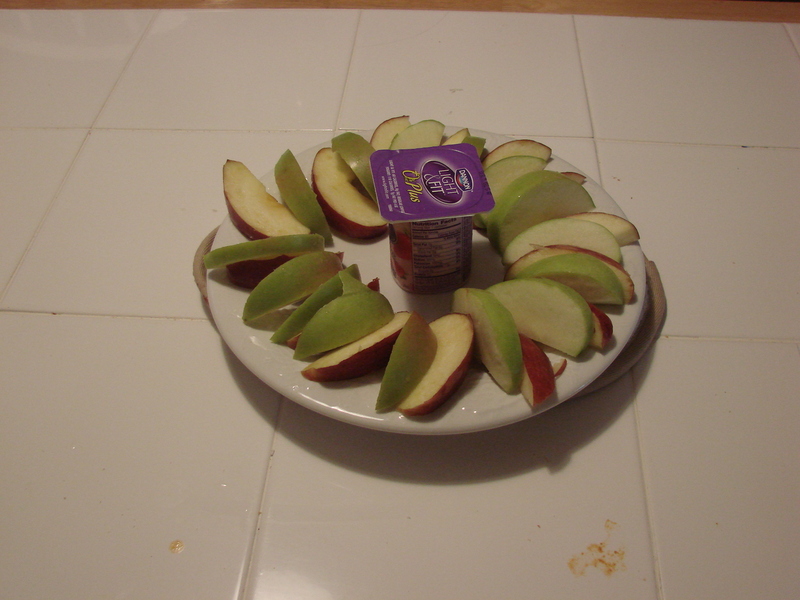 It is slices of apples and yogurt dip…yummy, yummy, yummy, even the kids love it. I like Danon, Light & Fit yogurt. Enjoy! Please check out some fruity recipes at Lorie’s. I cannot tell why toddlers LOVE stickers…and Rehema is no exception. the last two weeks Rehema decided that she is no longer interested in using the potty, I must say I was very frustrated. She has been potty trained for a while now. So, while I was at the doctor’s, I asked him what to do and he told me to start the chart all over again, give her a sticker for every time she goes. I printed a chart that evening, put it up, explained to her that she gets a sticker every time she goes, and after so many stickers, she gets a prize. It worked like magic and now all of a sudden, she has remembered how to use the potty…maybe she was just missing the stickers…:-) Since Clifford is in town, and she loves Clifford, that is going to be one of her treats, she does not know that yet, I can’t wait to see her face when she sees Clifford. but it may not be a very good thing, because she blames everything on Clifford…Clifford did it…I bet in no time, it will change to, Henry did it.